Edvard Grieg - the "Chopin of the North"
This page is about Anitra's Dance and Edvard Grieg. You can listen to Grieg, or buy sheet music by Grieg. The composer of Anitra's Dance, Edvard Hagerup Grieg, was born on 15th June 1843 and died on 4th September 1907. Edvard Grieg was a Norwegian pianist and one of the best known and most loved composers of the Romantic period. Edvard Grieg is known as a Nationalist composer as he drew inspiration from Norwegian folk music. Edvard Grieg's piano pieces are both melodic and lyrical, think Grieg "Morning" which is a beautiful melody, and he was known for his ability as a pianist as well as for his compositions. Grieg's most famous works are the Piano Concerto in A minor, his incidental music to Henrik Ibsen's play, Peer Gynt, and his Lyric Pieces - a collection for piano solo based on Norwegian Folk Tunes which led to some calling him the "Chopin of the North"
Image of Grieg from Wikipedia, used under Creative Commons license. Any music graphics are all my own creation, please do not copy! My piano teacher was a great fan of Grieg and introduced me to the Lyric Pieces in my teens. Anitra's Dance is less well known than Morning, Solveig's Song or In the Hall of the Mountain King. Anitra's Dance deserves a wider audience. Before Miss Robinson's piano lessons, I remember struggling with a classical guitar arrangement of this piece as a kid. It was hard! 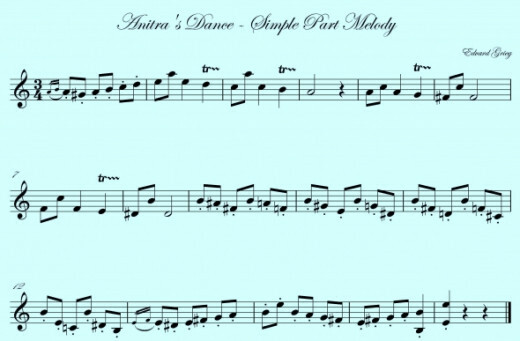 I am currently working on a simplified piano edition of Anitra's Dance, a rock version of the piece and a version for classical guitar ensemble. Watch this space! Here is the first section of Anitra's Dance, melody only. It is quite complicated to play because of all the chromatic notes. You can get guitar TAB for Anitra's Dance too. 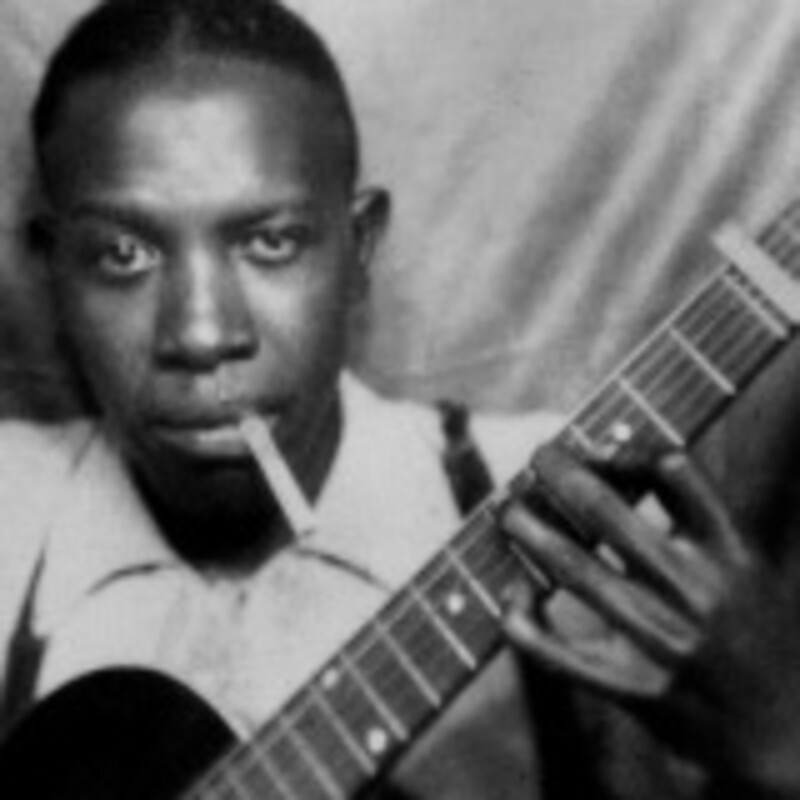 I have just completed my jazz waltz version of Anitra's Dance for Rock Guitar Group You can listen to the MP3 of Anitra's Dance for guitar group, buy the jazz rock score of Anitra's Dance or even buy Anitra's Dance TAB for lead guitar. This is my version, basically a nice clean score for ease of reading (the tempo direction and metronome marks on Scorch run together, but I checked it as a specimen and it prints out fine). Grieg's Anitra's Dance for Guitar group with rhythm guitar, lead guitar, bass and drums. This arrangement includes professionally edited TAB parts too! In 1870 the virtuose pianist and composer, Franz Liszt, met Grieg when Grieg travelled to Rome especially to meet him. They went over Grieg's Violin Sonata No. 1, which Liszt enjoyed greatly. On his second visit, in April, Grieg brought with him the music of his Piano Concerto, and Liszt was able to sight read the whole orchestral arrangement. Henrik Ibsen asked Grieg to compose incidental music for the premiere of play Peer Gynt. He was engaged in this from 1874-76. 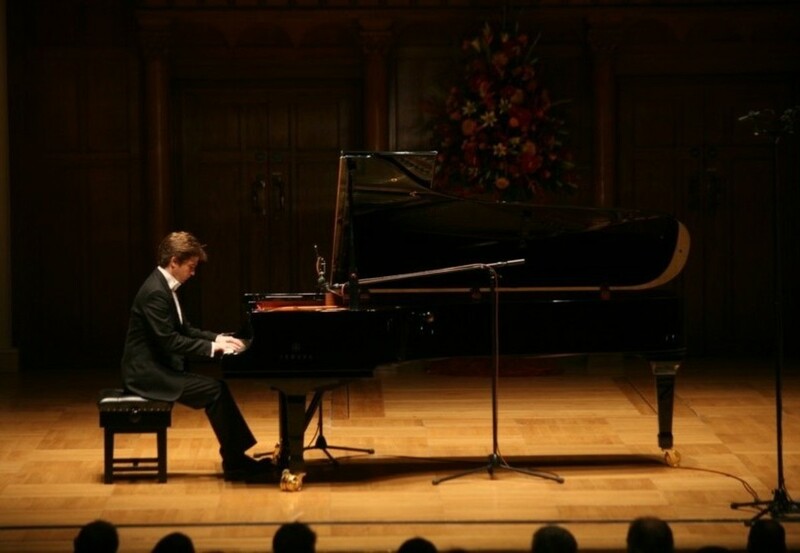 Many of the pieces from this work are now popular orchestral suites or piano and piano-duet arrangements. Peer Gynt had its premier on 24th February 1876 in Christiania (now called Oslo). There were 29 pieces in the complete score. Suite No. 2, Op. 55. I hope you will enjoy these videos of Anitras Dance. I found these arrangements offered for sale by composers on the Sibelius website. The descriptions given are the arrangers' own words. Sibelius Music provides no affilliate programme so these links are provided for information only. Anitra's Dance - Grieg captures the seductive Anitra in a deliciously sinuous oriental dance, very much in the spirit of Tchaikovsky and Saint-Saens. The wonderfully pale orchestral colours match the mirage-like nature of this scene in the play to perfection. This familiar melody from Edvard Grieg's PEER GYNT,is arranged by Matthew Drumm for 5-7 players. This arrangement would compliment any concert program. 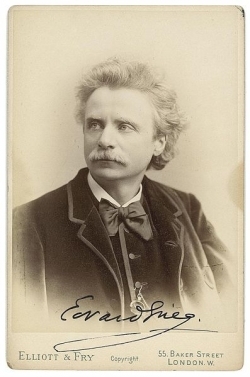 Free scores by Edvard Grieg are available in the International Music Score Library Project, the Werner Icking Music Archive (WIMA), the Choral Public Domain Library (ChoralWiki) and the Mutopia Project. All of these, plus vintage scores provide a resource for modern arrangers to access and work from. Did you know Grieg made recordings? "In spring 1903, Grieg made nine 78-rpm gramophone recordings of his piano music in Paris; all of these historic discs have been reissued on both LPs and CDs and, despite limited fidelity, show his artistry as a pianist. Grieg also made live-recording player piano music rolls for the Welte-Mignon reproducing system, all of which survive today and can be heard." * Sixty-six Lyric Pieces for piano in ten books, Op. 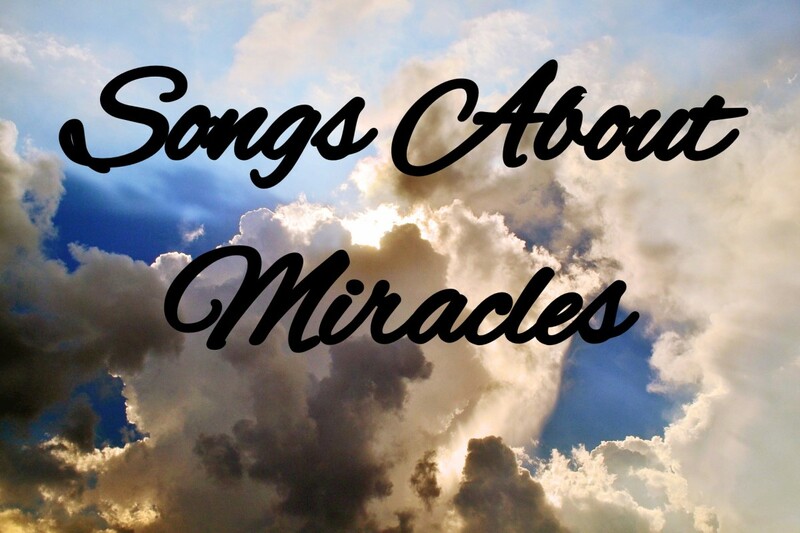 12, 38, 43, 47, 54, 57, 62, 65, 68 and 71, including: Arietta, To the Spring, Little Bird, Butterfly, Notturno, Wedding Day at Troldhaugen, At Your Feet, Longing For Home, March of the Dwarfs, PoÃ¨me Ã©rotique and Gone. Did you struggle to play this music as a child or is it new to you? What do you think of Anitra's Dance? Thank you for visiting. 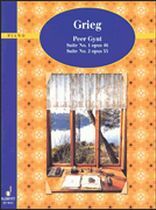 Do You like Edvard Grieg's Piano Music - Have you heard of Peer Gynt? Wow... 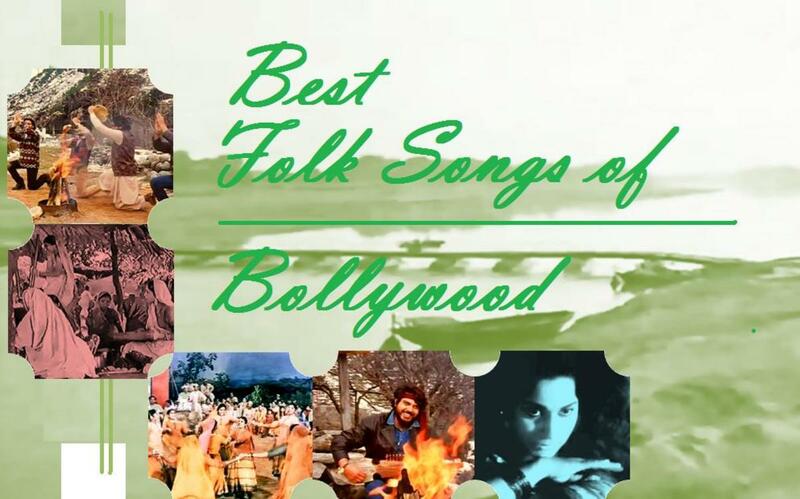 I had never heard of this before... :) Blessed! Not so many people know Grieg today, so thank you for that lens! Some of the wildest numbers of the Peer Gynt incidental music hit me by total surprise when I was listening to them webcast from Germany or Hungary, and I find it exciting there are those obscure bits to it I wasn't as familiar with as "Anitras Dance" or "Hall of the Mountain King." Ah, memories of butchering this in my teen years as an over-promoted second violin in the school orchestra. Angel blessed. Never heard his name and same goes for his Piano Music. I love music in general and will try to hear some of Edvard Greig's music on You Tube.